Before the beginning of complex treatment we draw up a detailed therapeutic plan based on complete radiological and dental diagnostics. 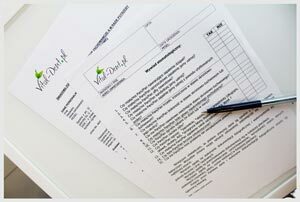 It is done during a consultation visit at Vital-Dent.pl. We offer various dental solutions individually adapted to the patient’s means and expectations, so that the therapeutic result and the cost are fully satisfactory. Dental services are charged individually according to the price-list (sample charges are listed below) as each case is different and may require a different approach. 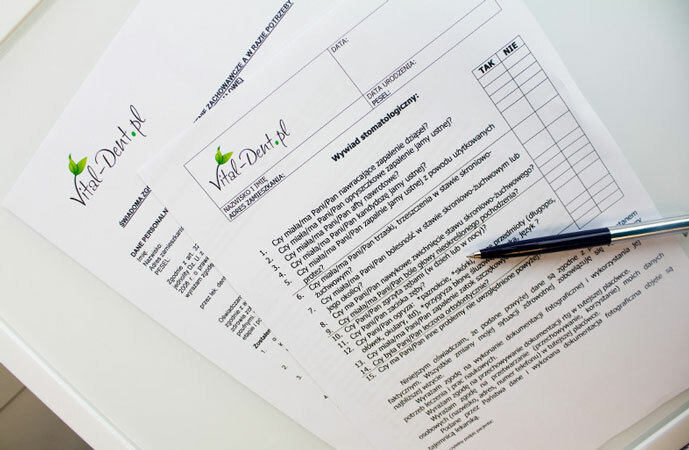 Treatment at Vital-Dent.pl aims at the patient’s comfort, thus each charge includes the cost of conventional anaesthesia. Filling of a primary tooth (colour filling): 110 PLN up. Canal therapy: 290 PLN up. Canal therapy with microscope: 440 PLN up. Hygienic procedures: 170 PLN up. Extraction of wisdom tooth: 180 PLN up. Insertion of implant: 2,100 PLN up. Philips ZOOM! Whitening: 800 PLN. We accept charge and credit cards.